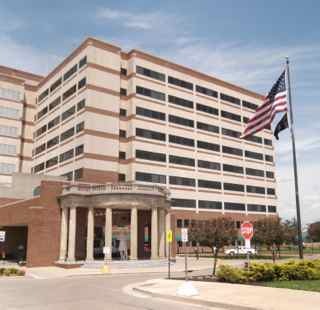 The Dayton VA Medical Center is huge and there is so much to see. The official address is at the corner of W. Third Street and South Gettysburg Avenue (4100 W. Third Street) but there is no entrance there. Head south on S. Gettysburg and you will find the main entrance and pull in there. Note: most of the streets inside the VA are “one way” so it is a challenge to get close to something special. 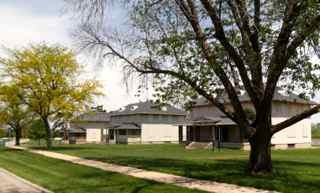 The National Home for Disabled Volunteer Soldiers (NHDVS) was made possible by congressional legislation signed by President Abraham Lincoln on March 3, 1865. 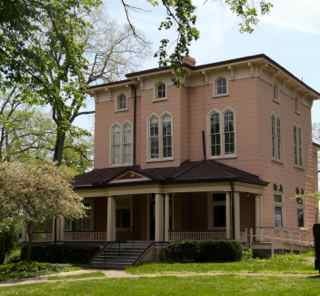 The Central Branch (Dayton) was one of the original three branches that served the disabled Veterans of the Civil War and became known as the Dayton Soldiers Home. From the outset, Veterans were given a zest for life through healthful exercise, reading, music, charming surroundings, and healthcare programs prepared them to re-enter society. 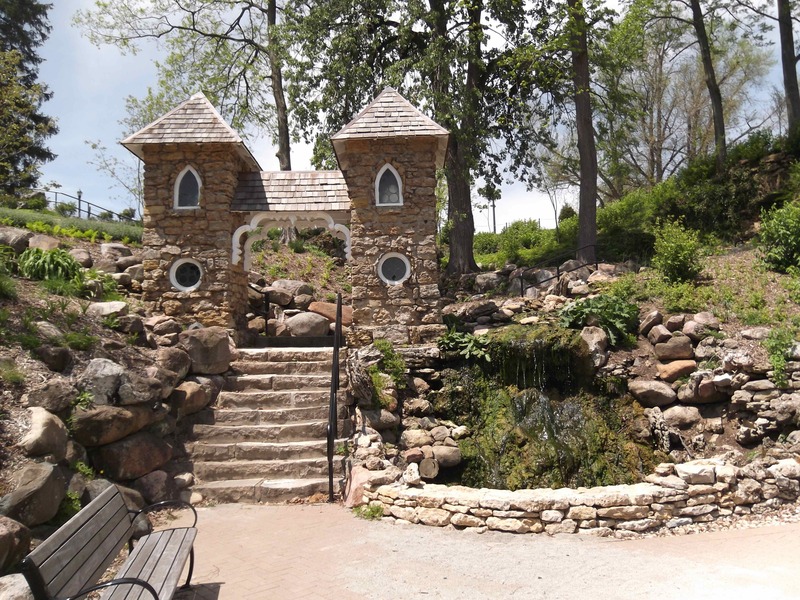 The Grotto and gardens received national recognition for beauty. 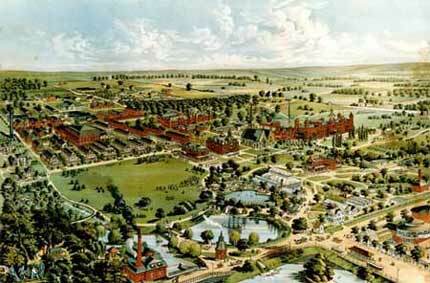 The campus became a popular tourist destination with accommodations that included a hotel and restaurant and attractions that included animal exhibits. 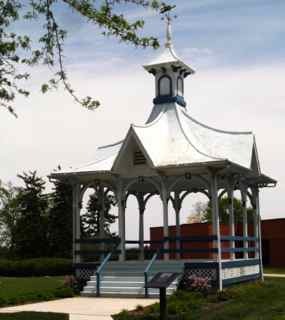 The Bandstand is the centerpiece of the Main Campus. This highly ornamental structure was brilliantly illuminated with gas lamps for evening concerts. The Home Band gave a concert every evening during pleasant weather. A civilian Chief Musician, 7 civilian musicians, and 16 Veteran musicians comprised the Home Band for 1885. There are a few large homes still there. The various leaders of this huge organization lived in these including the wives and children. It is easy to see empty lots where other homes were located. Home Chapel is the first permanent chapel ever constructed by the U.S. Government. 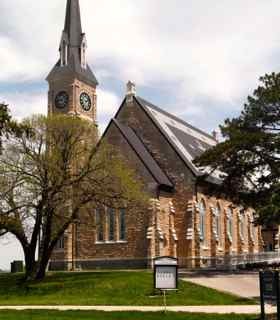 It was built using stones quarried there and the cornerstone was laid November 21, 1868. Home Chapel was dedicated in 1870, and the bell tower was added shortly afterward. Very close to Home Chapel is a Catholic Church. There are a few old building left on Pennsylvania Avenue. These were the homes of doctors who were taking care of the veterans. 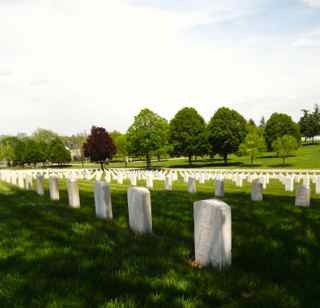 The Dayton National Cemetery is easy to find and you will see many, many gravestones. It was established as the permanent burial site for residents of the Central Branch of the National Asylum for Disabled Volunteer Soldiers in 1867. 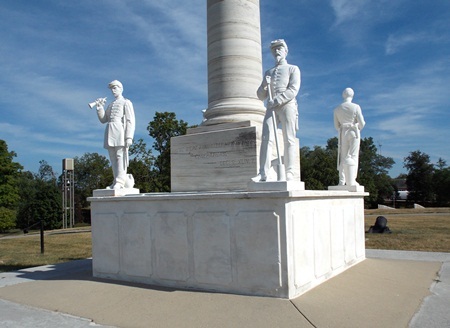 The Dayton Soldiers’ Monument dominates the national cemetery from atop a mound at the center of the landscape. The cornerstone was laid in 1873, and it was completed in 1877. 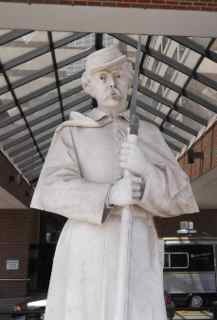 This dramatic structure is composed of a 30-foot marble column on a granite base with an ornamental cap and soldier posed at parade rest. At the corners of the base stand four figures representing the Infantry, Cavalry, Artillery and Navy. The VA Hospital is huge and it continually has additions and adjustments. As you head into the main door you can easily find the statue of Private Fair. This statue originally capped Dayton’s Civil War monument which was in downtown Dayton at the intersection of Main Street and Monument Avenue. It was built to honor the Nation’s Union veterans and Pvt. George Washington Fair of Dayton was the model. In 1991 a new bronze statue was cast and it was placed in a different location in downtown Dayton. To preserve the original statue from further damages to the elements, “Pvt. Fair” was rededicated at the VA Hospital in 1993. Driving around and exploring various places is a way to see and to think about what our veterans had been doing in the past and are doing now. Please Note: The Dayton CVB has compensated me for my thoughts on the Dayton VA Hospital & Museum.